Mommageddon- In which I throw a fit and nuke my neck. It started upstairs. Over laundry that wasn’t put away. (Why do I hate putting away laundry so much? I have no problem folding and washing it… it’s the PUTTING it away that I detest.) Anyway- that’s where it started. Or maybe it started with a craving for chocolate. And chips and salsa. What carried on? Nothing…. just a little Mommageddon. AKA: when I throw a tantrum that would make a toddler blush. Mommageddon always starts in my head- then explodes out my mouth like a nuclear attack. The fallout is (usually) temporary- and to be honest- my guys know to stay clear until it subsides. But this time- it didn’t stop with my mouth. Not when I noticed that the mail person had run over my fancy pants mailbox. because no one had shoveled. By this point I was furious. And possibly- psychotic. I grabbed my coat and stomped into my shoes. I stomped all the way to the garage. I grabbed the snow shovel and shoveled. It felt pretty good. It was as if the anger was scooped in every shovel full, at least for a while. Then it felt bad. Really bad. So bad, in fact, that I ended up at the ER. I’m hoping he will pat me on the head, reprimand me for being stupid and tell me it’s fine. Just be more careful in the future. The answer is: I hope so. I have got to come to grips with my limitations. I have got to get a grip on my frustration. I have got to reset my expectations. To be honest- I debated even posting about this. It’s embarrassing. Especially since 2 weeks ago the same doctor told me my second surgery had failed to fuse. Anger makes me stupid. But it doesn’t make me DO stupid things. That, was a choice. A choice compounded by hormones and stress. But a choice, none the less. So now- I’m paying a price. in pain. In MORE stress. Which is usually the effect of Momageddon’s. So.. if you’re having one of those days….. stop what you’re doing. Take a deep breath. Not all damage is visible in x-rays…..but Mommageddon’s cause damage. to ourselves. To our loved ones….. leave the shovel alone. Find a healthy way to deal with your anger. Exercise. (don’t roll your eyes at me.. it works.) talk. Pray. And maybe… let it go. Snow eventually melts. Children will come looking for clean clothes when they need them. You’re not alone. You can survive Mommageddon. Dear Lord- I hate it when I get stupid. I hate having limitations but even more than that- I hate losing my temper. Please help me to cope with frustrations in healthy ways. Please help me to let go of expectations that I need to let go of and please.. help me get my head screwed on straight. I love you Lord—- amen PS Lord—the whole PMS thing? Really. I’d like to quit. Not a fan. So I can dance…….MOPS Convention- a divine appointment I’m glad I kept. Mandisa’s words mocked me and brought tears to my eyes. I was afraid. I was in pain. I was on crutches and waiting for answers about what was wrong. “Do I have bone cancer? Will I need surgery? Are they missing something? Will I ever be able to walk without pain?” The thoughts invaded my time of worship… or maybe they became prayers. I could not dance. To be honest, I could barely walk. I desperately wanted to dance. I’m one of “those” people. I am as expressive in worship as I am in everything else. The truth is, I am as hyper in church as I am everywhere else. I can’t sit still. I’m the Tigger of Christianity. It was torturous to not be able to dance. I swayed. I wobbled. I tapped my feet and pushed my limits. But, I did not dance. I was angry. I was serving Jesus and (to be honest) I was suffering as I did it.. and I could’t even dance. Something I love so much -I think it’s part of my DNA. I felt totally ripped off. But- as Mandisa sang…. I found hope and joy… there are bigger shackles that I’ve worn- that keep me from dancing more than physically. Shackles of shame, fear, doubt insecurity. As I stood there…. I thought about all the ways God has been removing those shackles.. My tears of sadness and fear and anger- turned to joy. I knew that If he could remove those shackles- he could removal the shackle of pain I was going through…. A few weeks later- I was referred to a new doctor- an oncologist. (Yeah, that was fun. NOT.) In the first 5 minutes of our meeting she confirmed that it was NOT cancer- and that she could fix the stress fractures that had caused me so much pain. A week later, she did just that with a chunk of titanium and some screws. Last week- Mandisa joined us again at MOPS International Convention and she sang the song again. This year- I could dance. And I did. But, I had to be careful. I’m once again, in a season of sucktastic pain. Every time I try to get healthy-(Ive been biking- as per the doctors recommendation to give up the running thing- cause we know how that ended.) my body falls apart. 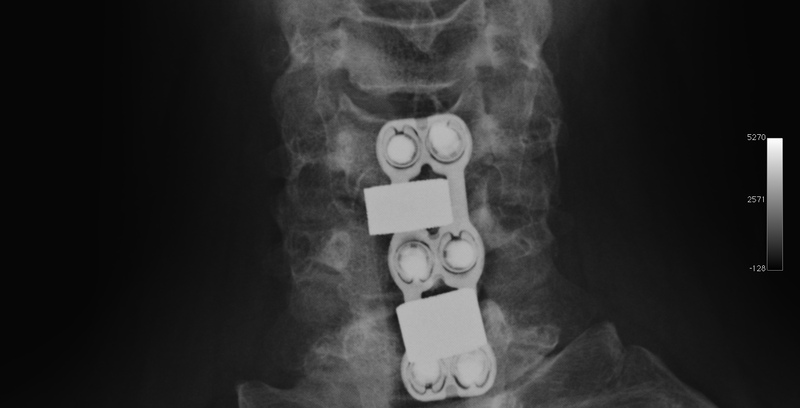 We recently found out I have some pretty crummy degeneration of discs in my neck. And bone spurs. And Arthopathy. And moderate to severe narrowing of and impingement of some nerve roots in my spine. It stinks. I’m in pain. I’m having neurological symptoms. (pain, weakness and tingling in my arms and hands in addition to my neck and shoulder.) I am having a hard time doing simple things, like buttoning my pants, cutting my food and securing my bra. Sometimes I laugh about it. (I call it the Zombie hand) Sometimes I cry. I am afraid. Yesterday,I had an MRI and I have an appointment with a neurosurgeon next week. I have a family history of severe back problems. (My dad has Degenerative disc disease and has had several procedures and my mom had her spine fused from t3 to the pelvis in March, due to severe scoliosis etc…..)I honestly have no clue what they will find/ recommend. But I know this: one year ago- I faced many of the same questions, fears, doubts and anger….and he took the shackles off my feet (once again) so I could dance. I believe he’ll do it again. When Mandisa sang those lyrics again this year- I left the session with mascara skid marks once again. And once again- I found hope in those words….He has a plan.. to remove our shackles…… not just to let us stubble around through life- but so we can DANCE. I may not like it- but- I know this- God is involved. I can already see it. My primary care physician gave me a referral to a neurosurgeon. Who just so happens to be the neurosurgeon who changed my mom’s life back in March by fixing what so many doctors had said could not be fixed. Her spine.. He gave her life back to her when pain was stealing it. He removed the shackles so she could dance……He’s also the head of neurology for a hospital our insurance participates with. I have to believe it’s not an accident. It’s God’s presence at work in our lives. I wasn’t expecting that the hand/ tingling thing was my neck. I thought I had carpal tunnel. (Web MD: FAIL) I went into shock when my primary care physician said he thinks I’ll need surgery. I didn’t hear another word he said. But- when he handed me that business card. Of the doctor I prayed would help my mom.. I felt God. I was still afraid- But I’m confident that God will remove this shackle to. I WILL DANCE. My favorite verse- “He who began a good work in you, is faithful to complete it.” I believe he is at work even now. Completing his plan for me.To remove every shackle. So I can dance. If not here- someday in heaven. I don’t know how you’re feeling today. But – someone out there is probably feeling shackled just like me. Angry. Scared. Desperate to dance- but shackled by something that won’t let you. Is it fear that keeps you from dancing into the call of God in your life? Is it anger that keeps you shackled to hurt? Is it an unmet desire that has you shackled to need that makes you feel like you are too needy to give- or maybe even live? Is it physical- sickness/disability junk that keeps you from – literally (or figuratively) dancing? You’re not alone. Neither am I- this (and MOPS International) is a safe place to share our shackles…share them in the comments- I’ll be praying for you. Maybe we can even help each other shed them- so we can dance. Together. Lord Jesus- I pray for each one who reads- your word says you desire to give us freedom… I pray that we can find it and hope in you. Remove our shackles Lord, so we can dance… in Jesus name- amen. I ALWAYS lock my car. I am the one who nags my husband to lock his car. But- apparently- I messed up. Big time. I know what happened. The other night- on my way home from Target- The sunset was SPECTACULAR. ( you can see the pics if you scroll down) I ran into the house- grabbed the kids -they know i’m crazy- and the camera and ran upstairs to watch it together. In the commotion, I must have forgot to lock the truck. Yesterday- when I went out to my car to go pick up groceries- I noticed my husband’s Tom-Tom- (His Christmas gift from last year) was GONE. It had been on the dash board the night before. Stolen. It’s just a “thing” but it made me so angry. DH called the police- they will be by tonight to make a report. But- the bottom line? It’s gone. Something special I bought for my hubby (who is hard to buy for like any man) is toast. I was (ok- I still AM) furious. The anger- I expected. What I didn’t expect- was the fear I felt later last night. I felt vulnerable. Afraid. Like maybe our neighborhood isn’t as “safe” as I thought. I checked and double checked the window and door locks before bed. I turned on every light- inside and out. This morning, I realized some people live in fear like this all the time. Their neighborhoods aren’t safe. It isn’t just an ocassional thing. It isn’t just “stuff” being stolen, but real violations. real hurts. I can’t imagine how hard that would be. This morning- I’m calmer. I managed to pray for the person who stole the tom-tom. I keep thinking “what a dumb thing to do- what a dumb thing to be imprisoned for”. In all probability it’s a kid who wanted to make a few quick bucks. Totally not worth being arrested for. The police said there have been a few other cars broken into, other stuff stolen. Who ever is doing this- has done it more than once. Eventually, they will be caught. I hope they stop. I hope they get some help. I hope they find out their life and freedom is worth so much more than “stuff.” I hope they realize they are hurting people. The tom- tom can be replaced. (besides- now I know what to buy him for Christmas this year). But freedom, lost can’t be. I feel so bad for this person- and for those who live in crime ridden areas…. will you pray for them with me? “Dear Jesus- you know I am angry. I am hurt. But- God- this is just a thing- so totally not as valuable as the person who stole it. I pray that they’d learn their value in your eyes. That they wouldn’t squander their life and freedom over “stuff”. Lord- I pray that I wouldn’t either. I may not steal, but God- you know the truth is I spend too much time worrying about, taking care of and cleaning- stuff. I guess I’m as guilty as anybody of wasting my life on stuff.